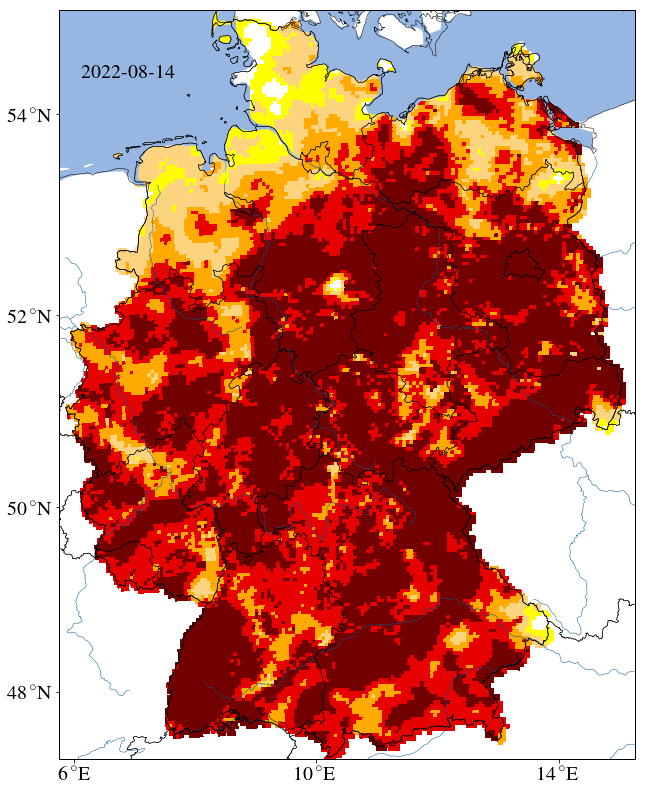 The German Drought Monitor (GDM) provides up-to-date high resolution drought information. An overview of the operational model chain is given in Zink et al. 2016. The GDM is based on the soil moisture index (SMI, Samaniego et. el 2013, JHM). It is displayed on a 4 km raster grid in 5 drought classes. The simulations are performed with the operational hydrological model system mHM ( www.ufz.de/mhm ). The drought monitor is updated daily. Due to data availability of the meteorological input data, the drought monitor has a lag time of one day. The underlying soil moisture index SMI is based on the frequency distribution of the soil moisture for 65 years starting in 1951. An actual value of 0.3 (Abnormally Dry) means that the actual soil moisture is as low as in 30% of the cases during the specific time within the year compared to 1951-2015. A value of 0.02 (Exceptional Drought) means that the soil moisture only fell below the actual value in 2% of the cases in 1951-2015. Further information can be found here. 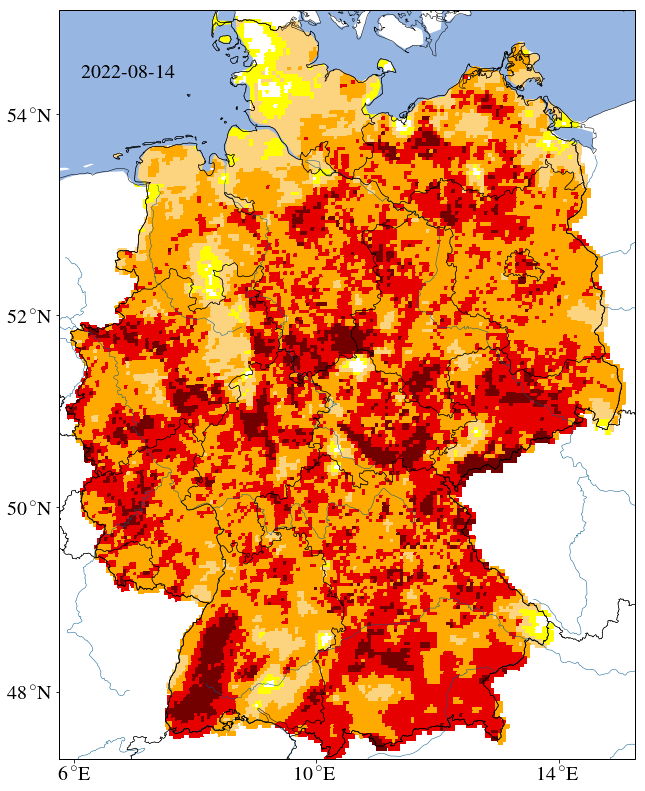 A recent comparison of the tresholds used here with data from the European Drought Impact Report Inventory (EDII) showed that the treshold 0.2 (drought class 'moderate drought') slightly underestimates drought damage in Germany. Click one image to start the galery. An Archive of monthly figures since 2014 is available here. We kindly acknowledge our data providers the German Weather Service (DWD), the European Environmental Agency (EEA), the Federal Institute for Geosciences and Natural Resources (BGR), the Federal Agency for Cartography and Geodesesy (BKG), the German Federal Institute of Hydrology (BfG), the National Aeronautics and Space Administration (NASA), the European Water Archive and the Global Runoff data Centre. The drought monitor is partly based on studies performed as part of the Helmholtz Alliance Climate Initiative REKLIM (www.reklim.de). Special thanks go to Ben Langenberg, Martin Abbrent and Sven Petruscke (WKDV) for their technical support considering the Linux-cluster and our homepage.